It’s finally time to say goodbye to winter and hello to spring. The new season officially starts this week—and while it may take a while before the snow melts completely, it’s never too early to start preparing for the health challenges that spring brings. In this series, we’ll look at the top concerns that our readers have when spring comes, and give you the best tips to deal with them. Nothing is worse than going on a family canoe trip or even just going for a walk late at night to discover that you’re covered in insect bites. It’s itchy, uncomfortable, and can be a real nuisance. But it can be worse than you imagined if that mosquito is carrying West Nile virus or another dangerous virus. You’ve heard about West Nile in the news, but it’s still common today. For some people, you’ll just develop flu-like symptoms, but for others, it could turn into something worse, like a neurological or neuroinvasive disease. 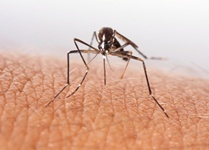 In fact, the Centers for Disease Control say people over the ages of 50, and especially people aged 65 and up, are most at risk of developing a disease like encephalitis and meningitis from a West Nile-inflicted mosquito bite. So what can you do to protect yourself from nasty insect bites? • Mosquitos and other insects love when the sun goes down. That’s when they’re most active and that’s when you need to protect yourself. If you’re going out for a walk, or if you’ll be spending significant time outdoors, wear long pants and a long-sleeve shirt. • Nighttime is also when you want to avoid going near any bushes or shrubs, also known as the place insects love to hang out. • Definitely protect yourself from insect bites with an insect-repellant spray (reapply every three hours, don’t apply on cuts or wounds—it will sting—and don’t apply on your face). • Picaridin: This natural repellant is based on the chemicals you would find in peppers, and it interferes with the insects’ ability to smell their prey. It has been found to be very effective repelling insects that rely on smell to locate and bite us, but not as effective for species that don’t use smell as their main tactic. It’s also less toxic than DEET, and so it’s a good alternative for those with sensitive skin. • Oils from lemon eucalyptus and soy oil have been found to be an effective insect repellant (however, they shouldn’t be used on young children). This spring, enjoy your time outdoors—but make sure you’ve protected yourself against mosquitos and other insects first. “Health Department Confirms 31 New West Nile Cases and One Death,” Office of Public Health, September 7 2012; http://new.dhh.louisiana.gov/index.cfm/newsroom/detail/2624, last accessed March 11, 2013.Eisenberg, S., “Bug Spray, Examined,” Natural Resources Defense Council, June 2012; http://www.nrdc.org/thisgreenlife/1006.asp; last accessed March 11, 2013.